SUNY Oswego's annual iron pour, a fiery collaboration Thursday, April 13, between the college's art and technology departments, will add an outdoor pit-firing of ceramic work a day earlier. Art faculty member Sara Prigodich and students in her advanced ceramics classes will demonstrate pit-firing techniques from 9:30 a.m. to 1:30 p.m. Wednesday, April 12, on the north side of Tyler Hall, near the iron pour's location. "This firing process is the oldest known method for firing ceramics and can produce a variety of interesting results," Prigodich said. "It’s also a great opportunity for other students and members of the campus and community to learn about a fun -- rather bonfire-like -- ceramic process." The iron pour, a signature event of students in Benjamin Entner's sculpture classes and the materials classes of technology faculty member Richard Bush, will take place approximately from 2 to 6 p.m. April 13 on the north side of Tyler Hall. "We hope to have 'scratch blocks' available on which people can quickly carve a relief plaque, and then we can cast it for them," said art faculty member Benjamin Enter, adding the event is "open to the campus and community -- all welcome!" Parking on campus requires a permit. For those without a current SUNY Oswego parking sticker, visit oswego.edu/parking for details on obtaining a daily-use permit. For more information about these events, contact the art department at 315-312-2111. For information about art programs at SUNY Oswego, visit oswego.edu/art. 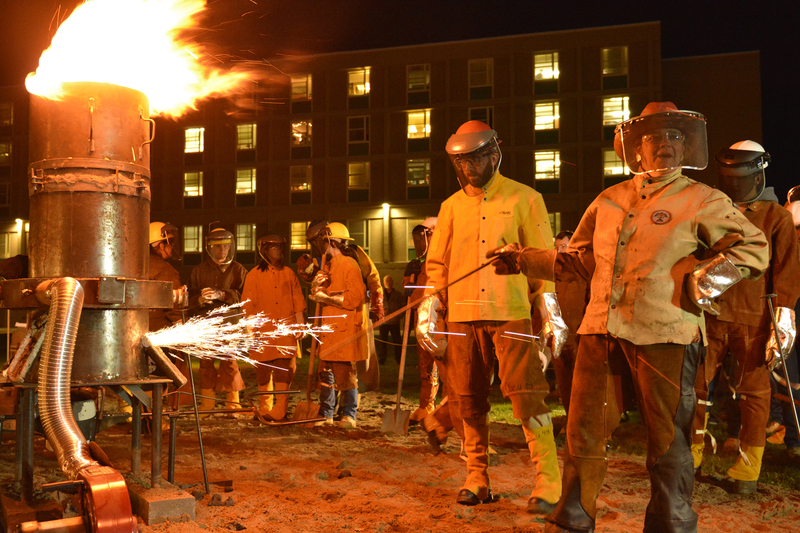 Art and fire -- Visiting sculptor Coral Lambert (foreground right) works toward a pour of molten iron in October 2015 as Benjamin Entner, a sculptor and SUNY Oswego art department faculty member, and a crowd of students and other faculty members look on in protective garb. The annual iron pour is scheduled for 2 to 6 p.m. Thursday, April 13, on the north side of Tyler Hall. On April 12, from 9:30 a.m. to 1:30 p.m., students and faculty member Sara Prigodich will demonstrate pit-firing of ceramics.